Former world champion Ricky Hatton says he will box again, more than three years since his last bout. "It's more than a comeback," said the Manchester-based boxer, 33. "I'm fighting to redeem myself." Hatton retired last year with a record of 45 wins and two defeats. But the Briton, who held the WBA and IBF light-welterweight and WBA welterweight titles, will return against an as yet unnamed opponent on 24 November at the Manchester Arena. 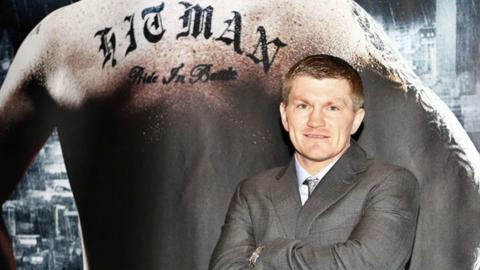 "I want British boxing to be proud of me again," added Hatton. "The only way to convince everyone I'm back is by flattening someone on 24 November." Hatton, nicknamed "The Hitman", has not fought since suffering a second-round knockout by Manny Pacquiao in May 2009. He was then stripped of his licence to box in 2010 after admitting using cocaine. But he appeared before the British Boxing Board of Control (BBBoC) in Cardiff on Wednesday to ask for it back. "It's been well documented what's happened to me since the last time I've been in a boxing ring," Hatton said. "I've started looking after myself a bit better and getting fitter. That's how it started. I don't want to be fighting at four or six-round levels - I want to fight for world titles. "It's about more than money, this comeback. People say nice things about me but they don't know what's been going on in between my ears." Hatton will have Manchester-based trainer Bob Shannon in his corner for the November fight, and it was Shannon's back-to-basics approach which appealed to the former two-weight world champion. "I'm in the best shape I've ever been in 12 weeks before a fight because I'm making up for three years of lost time," Hatton said. "Bob's been a good friend of mine and I've been watching him coach from a distance for a number of years and his method of training is the old-school way I like to train." BBBoC general secretary Robert Smith said Hatton looked "very well" and seemed to have "sorted himself out". "From what he was saying, he seems very settled with his family," Smith added. "He has already had some of the medicals and we are making sure he's on track." Hatton dominated the light-welterweight division, his most notable win coming against IBF champion Kostya Tszyu in 2005. The following year, the Briton defeated Puerto Rican Luis Collazo to take the WBA world welterweight title and followed that victory by beating Juan Urango to reclaim his IBF light-welterweight title. He lost to American five-division world champion Floyd Mayweather Jr in 2007 and suffered a comprehensive beating by Pacquiao in his final fight three years ago. "The manner of that defeat put me into some things which have been well documented... my life turned to mush," Hatton said. "I got back into promoting, which I loved, but it didn't quite fill the void. I got a huge buzz getting opportunities for my fighters and I was in the gym every day of the week passing on the knowledge, but it didn't fill the gap."